Jimmy Morrow was trying to go straight after having been put on probation for car theft. Now he's faced with a bum rap for stealing a valuable Spanish cross and killing the owner. Perry wants to give a kid a break and takes the case. Arthur Space as James Morrow, Sr.
CARS: 1959 Lincoln Continental MkIV, 4dr hardtop, white, 1958 Ford Thunderbird convertible, black, white top up (Drake), 1959 Cadillac series 62 convertible, black, black & white interior, top down (Mason), 1959 Ford Custom 300 4dr sedan, black & white (Police), Cameo: 1959 Ford Custom 300 4dr sedan, white. From The Cars by Greg Cockerill. Richard Miles makes his only Perry appearance here playing Jimmy Morrow. Richard Miles (born Gerald Richard Perreau) also acted under the name Peter Miles. Richard Miles was the brother of Gigi Perreau (�TCOT Desperate Daughter�, �TCOT Sleepy Slayer�) and Lauren Perreau (�TCOT Nine Dolls�) making the Perreau family the only triple siblings appearing on Perry. Submitted by PaulDrake 33, 23 September 2009. Perry's longish dramatic scene in the cellar trying to convince Felix to surrender was quite unusual for the series. You do not see this softer compassionate side of Perry much in the series. Submitted by Perry Baby 3/6/15. Sightings: Pencil Mustache Man makes another appearance in the far corner of the courtroom gallery, defendant�s side. When the hearing reconvenes after recess, our man reappears on the prosecutor�s side, second row. Both times he seems keenly interested in the proceedings. Oh, and then in a quick shot as Mr. Wormser is about to be re-crossed, we spy Distinguished Gentleman #1 back in the shadows of the defendant�s side. Lastly, Quiet Old Man can be seen to mutter with surprise when the killer is revealed! Submitted by gracep, 9/3/2010. + �Miss Carmody� is visible in the gallery just over Burger�s shoulder at the beginning of the courtroom scene. Submitted by alan_sings, 3 Oct 2010. + The rarely seen Distinguished Lady #3 is seated almost directly behind Perry. Read more about all these favorite frequent faces. + Maybe Gertie pulled closed from outside? ;-). OLEF641; 10/30/2017. Jonathan Hole as Wormser makes another appearance as unsavory and overly nervous character and involved in the crime. Submitted by Perry Baby 3/6/15.+And, just as in Episode #26 (TCOT Half-Wakened Wife), Jonathan Hole again pulls out a handkerchief to wipe the perspiration off his face as he is broken down on the witness stand by Perry. Submitted by BobH, 4 July 2016. I consider this one of those �topical� Perry Mason episodes. It deals with �juvenile delinquency,� a hot topic back then�Blackboard Jungle, Young Savages, Rebel Without a Cause, etc. 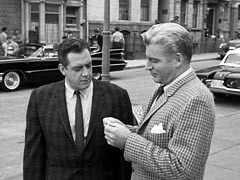 Since it is topical, the episode comes across more �dated� than is generally true for Perry Mason. Also, and this may be just me, I detect a bit of homoeroticism. Even so, it�s still a credible entry in the oeuvre. It's a bit ironic that the link to the obit of the actor who portrayed 'Jimmy', Gerald Perreau-Saissine, (see below Spoiler Warning) mentions him being survived by two male partners. Odd, I didn't feel any sense of homoeroticism when watching ... then again, my wife says I can't even tell when a woman is flirting with me, so what do I know? Submitted by MikeReese, 10/11/2016. + What you are calling homoeroticism might just be paternalism, if you are referring to the interaction between wise, kindly Mason and young Jimmy. Submitted by gracep, 9/3/2010. In retrospect, at least as far as juvenile delinquency goes, Eisenhower�s �America� really wasn't all that bad. Submitted by billp, 31 October 2009. The brief interlude between the judge and Burger regarding the latter's laryngitis seems odd; it plays no part in the plot other than to explain Burger�s hoarse voice. Why didn�t they just postpone filming that scene for a day or two? Submitted by Ed Zoerner, 2/1/2010. + To my ear the only time Burger sounded hoarse was when he apologized to the judge for being hoarse. Immediately thereafter in the same court session he sounded normal. Submitted by Kilo 4/29/2018. When leaving James Morrow, Sr.�s apartment, Mason leaves his card and Drake leaves a pack of cigarettes, presumably as an act of kindness. Submitted by gracep, 9/3/2010. This is one of the few times the series used (what can be said to be obviously) a backlot set for a street scene - such sets being called, depending on the studio, names like "New York Street" or "Chicago Street" - and it's not clear why, since the act of walking up to the apartment forms no meaningful part of the show, and whatever advantage there may have been gained by showing a poor neighborhood was - IMHO - more than offset by showing what was obviously not an LA street. Critiqued by Notcom, 110117. Gerald Perreau-Saissine (a.k.a Richard Miles/Peter Miles) turns in a decent performance as Jimmy, but seems to have dropped out of film/tv about this time. This makes Perry�s final comments about his character somewhat ironic. Since Perreau-Saissine seemed a credible actor and photogenic, his disappearance is curious. Whatever the explanation, he seems to have had an interesting life. (See his obit here and a retrospective here). +According to Wikipedia, "As Richard Miles, he wrote novels, poetry, and two screenplays. In 1963, he entered his first novel, That Cold Day in the Park, in a Dell Publishing contest; it did not win, but was considered worthy of publication (in 1965); it was made into a film of the same name in 1969." Out of this trial, Wormser was guilty of theft and perjury; and Felix should have had to return the cross. Could he be charged with anything? He admitted he probably has stolen artifacts when he was negotiating to buy the cross. He also drugged Wormser and held stolen property. Submitted by Perry Baby 1/21/18. I remember my mom, who was usually ironing, with pre-teen me on the couch, mentioning "loose ends" after watching PM when they were new.